Andy Thomson scored 114 Queen of the South first team goals placing him in the select handful to score 100 or more such QoS goals. His highest scoring season in England was with QPR where he top scored for the club. However his career down South is best remembered for his Wembley play off winning goal for Gillingham. Andy Thomson contributed directly to this article with an interview in 2008. 18 year old Andy Thomson signed on 28 July 1989 for Queen of the South from Motherwell boys’ club Jerviston F.C. Clearly talented even from the outset, Thomson went on to become a Palmerston goal scoring great. In each of his last three seasons at Queens, Thomson scored over 20 league goals – 26, 21 and 31 respectively. When Thomson scored his 99th Queens goal he overtook John Dempster as the club’s all time third highest scorer. When he scored his 100th goal he joined Jim Patterson and Bobby Black as the only players in the Queens ‘ton up’ club (the tallies of Dempster and Black are additionally impressive as both played on the wing). At the beginning of season 1990-91 Queens knocked Montrose out of the League Cup 2-1 after extra time. In the next round against Dundee from the division above, the score was 1-1 at full time. On this occasion extra time wasn’t enough to separate the sides in a 2-2 draw. In Palmerston’s first ever penalty shootout Alan Davidson saved two spot kicks for the home side to go through. The next challenge was a team from two divisions above, Dunfermline Athletic. In a game that Thomson remembers well, extra time was again needed to separate the sides. “I scored the winner in that game. A cross came in from the left from Ian Thomson and I had lost a contact lens. I scored with a diving header.” Queens won 2-1. Two Dumfries lads were in the Pars team that night, Davie Irons and Ian McCall. Next it was the last eight and a trip to Celtic Park. With Celtic a goal up, Andy Thomson diverted a cross from the left past Pat Bonner for a second half equaliser for battling Queens. With extra time looming, substitute Joe Miller scored the winner with seven minutes remaining to deny Queens their first League Cup semi final appearance since 1961. Thomson’s record in his first spell was 109 goals in all competitions. In 1991-92 he was the Scottish Second Division Player of the Year. Thomson picked up the title again in1993-94 as well as being the country’s top scorer. Thomson also collected a case of champagne from the Daily Record recognising his goal scoring feats. Aberdeen offered £150,000 for Thomson but this was rejected. Southend United offered to break their record fee paid with £250,000 and Thomson left for Essex on 4th July 1994. This remains the record transfer fee received by Queens. 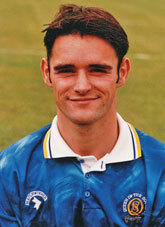 Andy Thomson returned to Palmerston Park to guest for Queen of the South on 23rd April 1995. The opposition in the 2-2 draw was Rangers in a game to mark Queens’ 75th anniversary and the opening of the new stand. Playing with Thomson were fellow ex-Queens players Ted McMinn, Davie Irons and Rowan Alexander. Thomson spent four seasons with Southend and one with Oxford before joining Gillingham. Andy Thomson signed for Gillingham on August 5th 1999. Two short months before Gillingham had been in their first ever appearance at Wembley Stadium. Goals by Carl Asaba and Robert Taylor in the 81st and 86th minutes had fans convinced they would be going to the second tier of English League football for the first time in their history. That’s not how it worked out. Man City’s Kevin Horlock scored in the 90th minute of the game before Paul Dickov equalised five minutes into injury time to take the game into extra time. No more goals meant penalties. Man City won the shoot out 3-1 to seal promotion. Character building stuff. With Thomson now on board the next season was Gillingham’s best ever. Fine league form pushing for promotion was supplemented with the Gills best ever FA Cup run. Thomson scored in each of four straight home FA Cup victories including against top division sides Bradford City (3-1) in the 4th round and Sheffield Wednesday in the 5th (3-1 again). The quarter finals brought a tie away at Stamford Bridge. Gianluca Vialli fielded an impressively strong line up despite the curse of Babayaro (the Nigerian had gone AWOL for the moment in Africa). 1-0 down at half time (Flo the scorer), Gillingham were still in with a shout before Chelsea pushed on from a 2nd goal (Terry finding the target this time). A third goal came from Weah before a late penalty converted by gorgon Zola turned the Gills defence to stone - Morris added a fifth goal minutes later. Chelsea went on to win the final 1-0 after a goalkeeping error by Aston Villa’s David James. In the league that season Thomson missed the final few games through injury. This included the vital last game of the season. Needing to win away at Wrexham the Gills fluffed their lines and lost 1-0 to finish 3rd – the playoffs again. “I didn’t really understand as I’d never played in the play offs before. For the players who had played in the final the year before, who knew what it was all about, it was a great occasion." An attendance over 53000 was made up of 80% Gillingham fans. Peter Taylor picked 8 starters from the 11 who started the previous season’s final. Gillingham led 1-0 at half time. In the 53rd minute Wigan’s Simon Haworth received the ball in what The Independent described as, “On the angle of the six-yard area at the near post, he flicked the ball up with his left foot before lobbing Bartram on the volley with the outside of his right from an acute angle. One of Wembley’s great goals, the kind of finishing purists had hoped to see from Brazil 24 hours earlier.” It stayed 1-1 after 90 minutes. Substitute Andy Thomson was brought on seven minutes into extra time. Two minutes later Wigan were ahead when Graham Barlow converted a spot kick. Peter Taylor brought on another sub in the shape of Steve Butler who equalised with six minutes remaining. Ty Gooden crossed from the right. Thomson stole in front of Stuart Balmer to glance a header into the far corner of the net. The goal was reminiscent of Keith Houchen’s 1987 FA Cup final goal for Coventry City against Tottenham Hotspur. “You couldn’t explain in terms of how amazing it is. Even just to go to Wembley was a wonderful experience. I grew up watching Scotland play at Wembley. To play there and ultimately score the winner was the stuff dreams are made of." ”The club’s website describes Thomson’s goal as, "The most iconic moment in the long history of Gillingham F.C. encapsulated in a few moments of extra time football". Promoted to the second flight Thomson pitched in with goals in further club milestone games – their first point in the second tier (1-1 at home to Portsmouth) and the first second tier away win (2-1 against Sheffield United). “Initially it took us a while to find our feet at a higher league but once we’d adjusted we did really well as a team. The team spirit carried us through again. It was great to play at big grounds in front of big crowds”. Thomson also hit both his side’s goals in the 4-2 League Cup defeat by Man City. There was no repeat of the previous season’s F.A. Cup run as the Gills went out in January, again to Chelsea, this time 4-2 despite giving the Londoners a shock. Seemingly in easy street at 3-0 up, the Gills battled back to 3-2 and had their illustrious opponents in trouble before Gudjohnsen’s 90th minute goal killed the tie. However, more tellingly, Thomson’s involvement was only that of a late substitute appearance. In the 24 team division Gillingham finished comfortably in mid table at 13th – but not with Thomson at the club. Thomson said that new manager Andy Hessenthaler “Had his own ideas and new people he had brought in who he wanted to play, which was fair enough. I was offered a new deal but wanted a better chance of playing regularly. That was the reason I moved to Q.P.R.” Previous manager Peter Taylor later described Andy Thomson as the best £25,000 he ever spent. “I think that’s because he never spent £25,000 on anybody else”, joked Thomson modestly. Andy Thomson joined QPR in decent scoring form. In the 8 league games he played at the end of the 2000-01 season, Thomson found the net four times. This wasn’t enough to save the West Londoners from the drop. The season after saw Thomson’s best tally in England. Thomson’s 21 goals from his 38 league games including a hat trick at home against Port Vale made him the club’s top scorer that season. Andy Thomson joined then top division Partick Thistle for the 2003/04 season where he stayed for one season before joining Falkirk. At Falkirk Thomson scored a League Cup hat trick against Peterhead before he repeated his earlier feat at Queens of scoring against Celtic in the League Cup. This time the Glasgow side cracked in eight in response. Thomson played his only two senior games of his career against Queens winning both and without scoring himself. Thomson was promoted with Falkirk to the Scottish top flight in 2005. 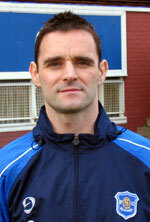 Then out of the first team picture by Christmas, Thomson rejoined Queens in January 2006. The mid 90s had brought many things in UK society. Not just ‘New Labour’ but also ‘New Queens’. Interviewed on his return for the Queens website after a decade away Thomson commented, “Things have changed quite a bit while I’ve been away - a new stand, a completely new set-up and a more modern type of training system." Thomson added five further goals to give him a final tally at Queens of 114. As at 3 November 2017 him fourth highest goal scorer in Queens history behind Jim Patterson, Bobby Black and Derek Lyle. After his final year at Queens, Andy Thomson moved to Stenhousemuir before retiring from playing in March 2008. On 1st January 2013 Thomson was announced as being a 2013 inductee into the Queen of the South Hall of Fame.